Cherries require a certain number of low-temperature days as a chilling time to produce fruit. Many cherry varieties grown in zone 8 will not grow fruit due to the warm weather. In zone 8, temperatures rarely dip below 10 degrees F in winter. A few hybrid trees will set fruit in zone 8. To have a good crop of cherries, select from hybrid varieties for zone 8. Select a location for your cherry trees in full sun with good drainage. Cherry tree roots will rot in areas of poor drainage. A south-facing hillside is a good location to plant cherry trees. Collect soil samples by digging a quart of soil from up to 10 locations over your cherry tree property with a soil augur. Mix the samples in a bucket and pick out any debris such as grass, roots, sticks and rocks. Allow the soil to dry and collect a cup of it in a plastic sandwich bag. Take the soil to your county extension service for soil testing. An agent with the extension service will send your soil to the nearest agricultural university-run laboratory. The laboratory will analyze the soil for the pH and soil structure. The test results will include recommendations of soil amendments to add for your cherry trees. Tests cost a minimal fee, and results are usually provided within three weeks. Break up the soil in your cherry orchard over a wide range with a rototiller to provide a good environment for the cherry trees to develop an extensive root system. Cherry trees that are planted in narrow swaths of prepared soil will keep their roots close to the trunk. This is known as a potted tree effect. Break up the soil to a depth of 12 inches. Spread a 4-inch thick layer of soil amendments over the soil based on the results of your soil test. Good soil amendments for cherry trees include organic amendments to improve drainage and nutrients structure such as peat moss, compost and well rotted manure. Cherries also like slightly-acidic soil between 6.2 and 6.8. Add sulfur to lower the pH of your soil, or lime to raise the pH. Select later-blooming cherry tree varieties with lower chilling hour requirements that are suitable for zone 8. Good zone 8 cherry tree varieties include Lapins and North Star. Montmorency will also grow in portions of zone 8. 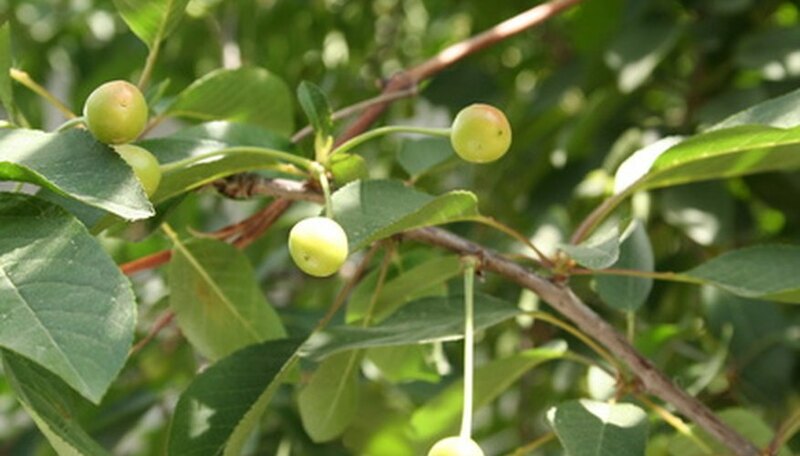 Plant sweet cherries such as Lapins in twos so that they can cross pollinate. Sour cherries such as North Star and Montmorency are self-fruitful and can be planted singly. Dig a planting pocket for your trees that is twice as wide but no deeper than the root ball of the trees. Fill in around the sides of the cherry tree’s root ball with soil. Water the soil to dislodge air pockets and fill in the extra space with soil. Mulch around the tree with wood chips or cover the root zone with plastic mulch to keep weeds from becoming established. Water trees just enough to keep the ground as wet as a wrung-out sponge during the first year while the tree becomes established. Use approximately 1 inch of water per square inch of soil. You can use a rain gauge to measure this. Once the tree has become established, you will only need to water during drought periods. Chase birds away during fruiting periods using scarecrows or by hanging noise makers, tin foil or CDs that reflect light. Harvest cherries as soon as they become ripe.